It’s been three weeks, possibly more, since morning sickness has ruled my days. However, today, it made it’s return with a vengeance. Lucky for me, I was told I didn’t have to come into work today. Happy Turkey Day to me! Anyway, after making my mandatory trip to the grocery to get some last minute ingredients for tomorrow’s big day, I crawled back in bed hoping the sickness would subside. What better way to spend a sick morning than with some Regis & Kelly and the Today show? As I laid in bed I heard Hoda and Kathie Lee begin discussing turkey. This was not just any turkey, but another turkey cake. 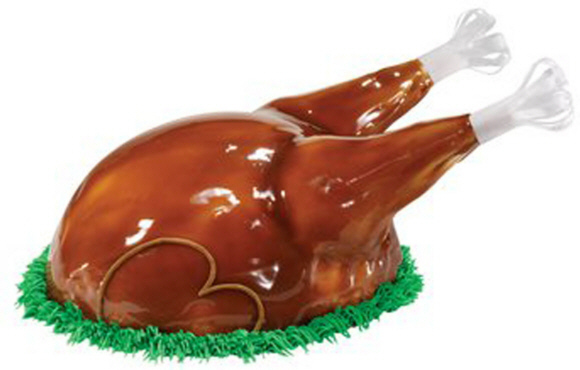 An ice cream turkey cake to be exact. Baskin-Robbins has brought back this special cake just for the holiday tomorrow. Want a turkey leg? Well, you’re going to get a sugar cone filled with creamy goodness. This certainly is more appetizing than the previous turkey cake we saw this week. This little discovery serves 12-16. Turkey for dessert? Yes, please. For some reason the pregnancy cravings have been big on apples the past few weeks. 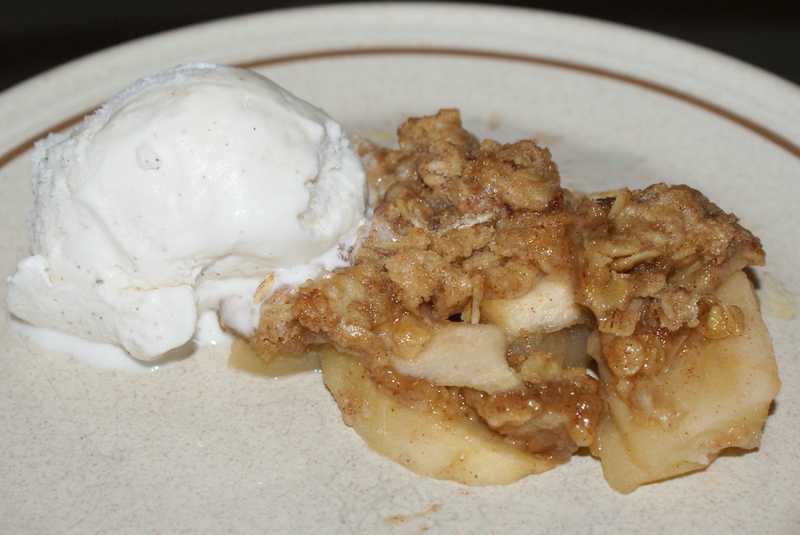 So, when I stumbled across a recipe for Apple Crisp the other day and just had to try it out. Now, I’ve never really cooked with apples before, let’s not forget I’m new to this whole baking thing. Keeping this in mind, I’d say it went pretty well. The end product was holiday happiness in a dessert. From the sourness of the apples to the sweetness of the sugar and oats, it was one you’ll certainly go back for more. Oh and let’s not forget the scent of baking apples that fill your house. Even if this hadn’t turned out to be a delectable dessert, the smell wafting through the house would have been treat enough. This quick recipe would be great for a Thanksgiving dessert or just as a sweet treat for you and your family. Side note: Who knew peeling apples could feel like such a work out? Pre-heat oven to 375ºF. Grease bottom and sides of 8-inch square pan and set aside. 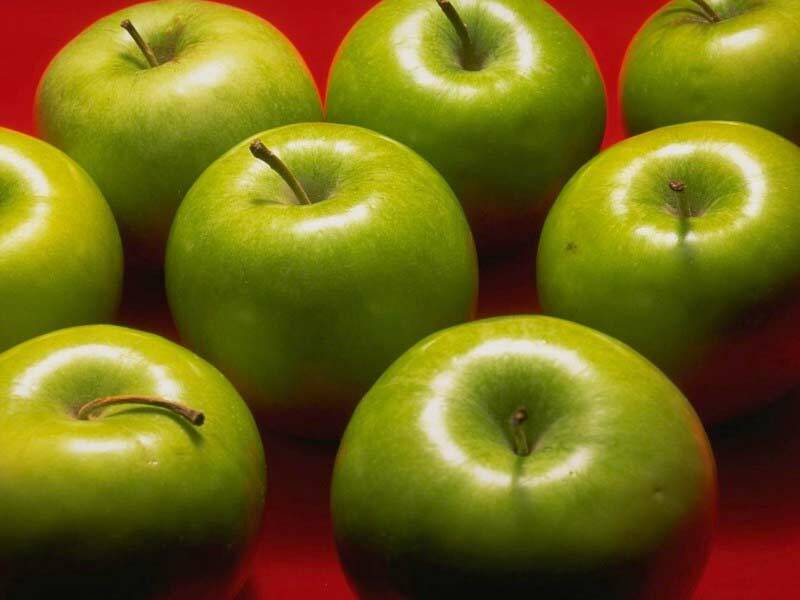 Toss apples with 1/4 cup sugar and 1 tsp. cinnamon then spread in pan. In medium bowl, stir remaining ingredients and sprinkle over apples. Bake about 30 minutes or until topping is golden brown and apples are tender when pierced with a fork. Also, I recommend serving warm with some nice vanilla ice cream. YUM! 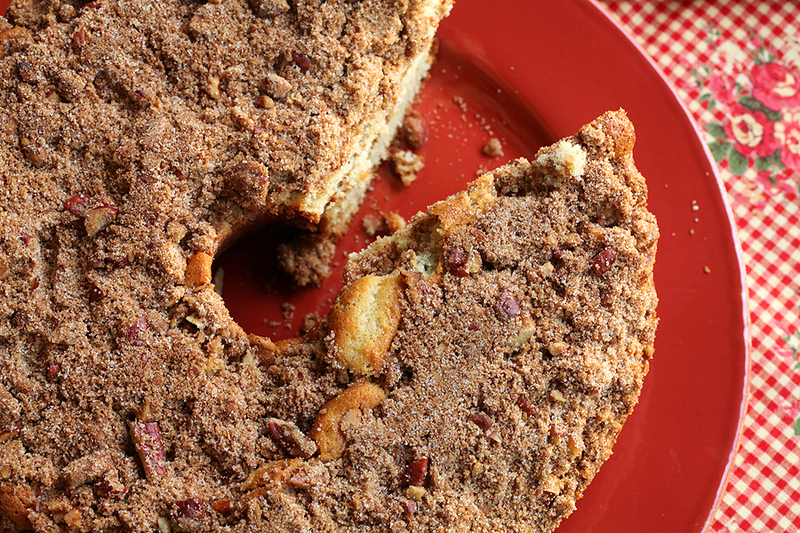 Every Thanksgiving my Grandmother’s neighbor brings over the most delicious coffee cake on the face of the planet. Wrapped under layer upon layer of green saran wrap you finally find a moist cake with cinnamon and nut crumbs sprinkled on top. I mean this cake is so good you find yourself just ripping and tearing at the frustrating wrap to get to the scrumptious goodness inside. This cake from The Meaning of Pie is the closest I’ve been able to find to this favorite treat of mine. If it wasn’t so close to Turkey day I’d have to try this recipe immediately. However, only four more days until someone will just be handing me this delicious cake. Thank goodness for the holidays! Working in a new kitchen is always an interesting adventure to say the least. And our new-to-us kitchen is very, very old. With an odd layout and barely-there water pressure, let’s just say I hit a few snags during this baking process. That said, this semi-simple bake was well worth the first time struggles. Preheat oven to 350 degrees. Spray 9×13 baking pan lightly with cooking spray and set aside. Beat with an electric mixer on low speed cake mix, butter, egg, and food coloring until combined. Press cake mixture into prepared pan. Have a bit of flour set aside to dust your hands, this makes the process of patting the cake into the pan. 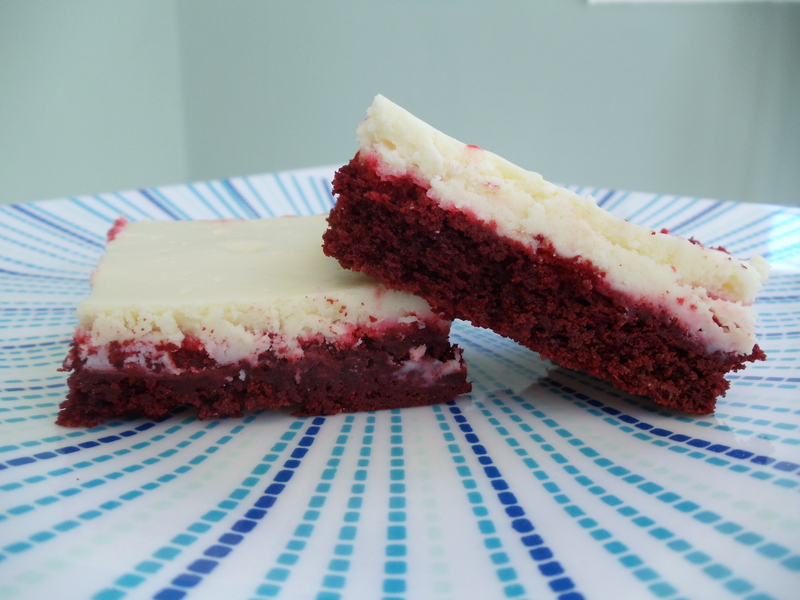 Beat cream cheese and sugar on medium speed until creamy. Add eggs and vanilla, beat to combine. Spread cream cheese mixture over cake layer. Bake in preheated oven for 40 minutes, or until bars barely start to pull away from sides. Cool completely before cutting. This cake has made me do a triple take. 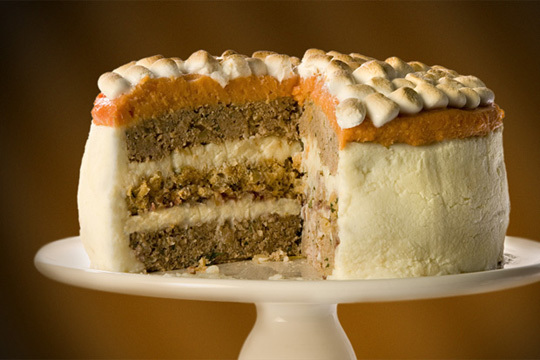 Layered with all of your favorite Thanksgiving day goodies, this is a shmorgishborg of flavors. Talk about a taste-bud overload! My husband always loves stacking his food on his bread for certain meals. Such as toast, with mash potatoes, macaroni and pork loin. I always look at him a little crazy, but that is nothing compared to this stacker of a cake. Featuring three layer of turkey meatloaf, mashed potatoes, sausage stuffing and cranberry sauce, topped off with sweet potatoes and marshmallows. Whew! That’s a lot to even just list out much less eat at once. Could you handle this Thanksgiving Cake feast? Is it me or do the Holidays begin earlier and earlier every year? Since Labor Day, I’ve had friends tweeting about decorating for Halloween and Thanksgiving and raving over their new fall recipes. Seeing as we’ve just moved, there were no festive fall decorations for us this year, but the recipe gathering has been like a jackpot in Vegas. 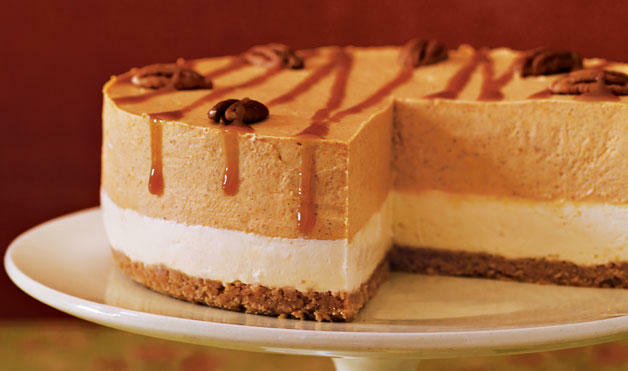 The one craving I just haven’t been able to shake is Pumpkin Cheesecake. Can you blame me? Just look at that delectable picture teasing us. Upon following a pregnancy craving for yogurt, I managed to satisfy two cravings with one trip. 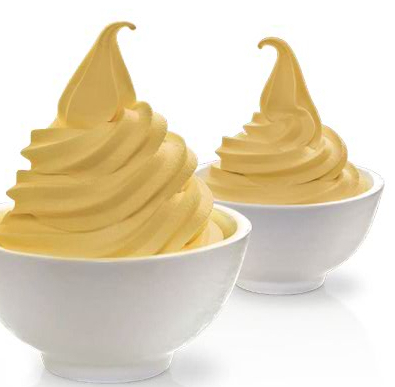 May I now introduce to you, Pumpkin Yogurt. Sweet CeCe’s, a new treat being introduced to the Middle Tennessee area, was the perfect sweet stop for this craving. The shop is fanciful with walls painted turquoise and pink, lavished in decorations of candy. Oh and the yogurt is to die for. They feature a range of flavors and more than a few candies and desserts to top it off with. Of course, I chose pumpkin yogurt and sprinkled it with rather large squares of cheesecake. Absolute perfection.